My name is Annette and I’m a researcher at the University of Oxford. I have been doing research on Skomer since 2011, first as a research assistant, then as a PhD student, and now as a fully-fledged postdoctoral researcher. 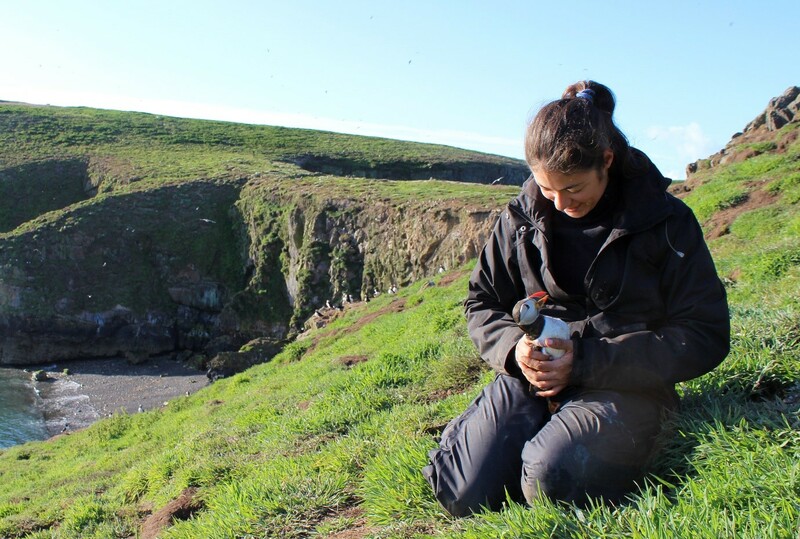 I am lucky enough to come and spend some time on the island each year (for up to 5 months when I’m really lucky), to study the seabirds on the island. Some of you may have met me, when I’m not up in the middle of the night tracking shearwaters, awake at dawn observing puffins, or with my arm down a burrow in the middle of the day, I’m usually working on my computer in the library. Over the last 5 years I have been working with Manx shearwaters, guillemots, razorbills and kittiwakes, but my main study species during my PhD was the Atlantic puffin. Figure 1 – Annette at work. Not a bad job? (photo M. Kavelaars). We are approaching the end of July, when young pufflings fledge from their burrow in the middle of the night and adults gather on the clifftops of Skomer, ready to leave the island until next spring. Finding out where they are heading off and what they are be up to for the next 8 months were one the main objectives of my PhD. 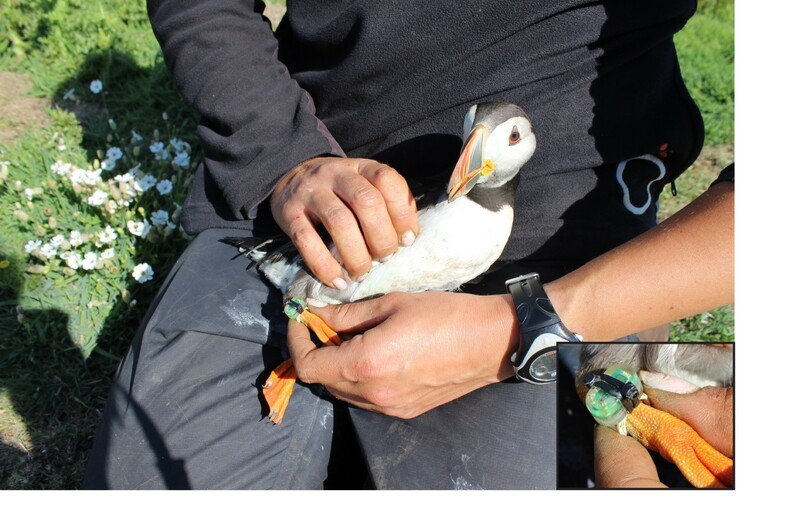 To answer these questions, year after year, I attached miniature trackers on a plastic ring around the leg of breeding adult puffins, and recaptured them a year later to download data from the devices. The loggers, called geolocators, weigh less than 2g and measure light levels (from which we can infer approximate position) and saltwater immersion (the proportion of time spent wet for each 10 minute block, which helps us identify sitting, flying and foraging behaviour when the birds are at sea). The devices are tiny (Figure 2), all birds are only manipulated (very cautiously) once a year, and they do not seem disturbed by the study, as their survival rate and breeding success is comparable to those of undisturbed puffins. Figure 2 – A puffin with a newly deployed geolocator on its right leg (photo M. Kavelaars). So what did I learn from the data collected by these geolocators? Well, after tracking about a dozen birds each year for multiple years, I obtained a good picture of where the adult puffins go and spend the autumn and winter after they leave Skomer. And this picture is really quite astonishing. They seem to go pretty much everywhere (in the North Atlantic). Not only was I surprised to see that puffins, with their stubby little wings (which make flight very energy-demanding), could migrate thousands of miles away from their colony, but I was also amazed to see that puffins which had been breeding in burrows a few meters apart were spending the winter in completely different places. Indeed, individual Skomer puffins migrate to a whole range of different places. Some will remain around the UK and Ireland, others will venture westwards to the Atlantic Ocean, near Iceland, Greeland or even, in one particular case, to Newfoundland (Canada) and the Labrador Sea. Later in the winter, some birds will then move towards the French and Iberian coast, and about 20% will even go and spend a few months in the Mediterranean. Tracking the same individuals for multiple years also showed that puffins are very consistent in their migratory journeys, and keep following the same route, year after year. A few examples are presented in Figure 3. 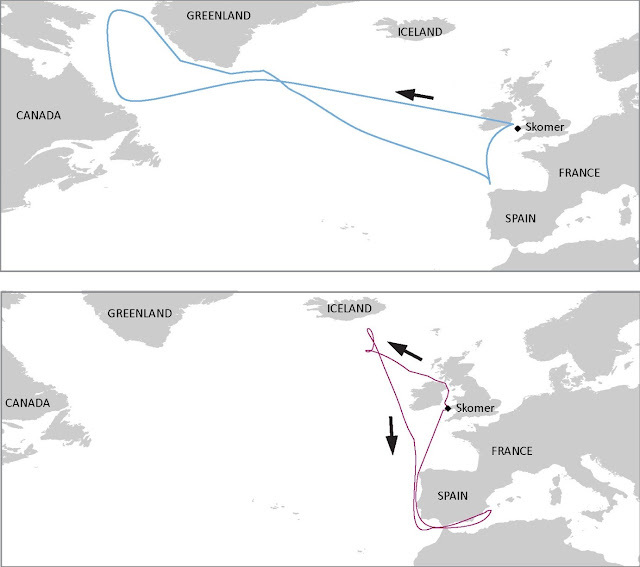 Figure 3 – Two examples of the migratory journeys of Skomer puffins (the lines represent approximate trajectories, ± 180 km. Puffins do not fly across land). Many questions remain unanswered regarding these striking migratory patterns. How do these routes develop? Do young puffins inherit their parents’ routes? Are some routes better than others? While I don’t have space here to develop on all the results I found, this study was published early this year in an Open Access paper you can all access here and you can find a few more answers in the paper (not all, unfortunately!). For example, puffins visiting the Mediterranean Sea seem to spend more time foraging overwinter, and to have a higher breeding success than others. I invite you to have a read if you want to know more! Puffin population worldwide are declining and they were recently classified by the IUCN as endangered. What do these migratory patterns mean for puffin conservation? This diversity of routes makes it more difficult to pinpoint a single area which is critical to the winter survival of all Skomer puffins, but it may perhaps also enable the Skomer population to be more resilient; for example if dramatic storms or oil spills affect puffins off the coast of Ireland in winter, only a proportion of them would be affected, as many others would be visiting other areas far away. Future puffin conservation however should most likely rely on multi-colony studies, as the migratory patterns of Skomer puffins may not reflect that of other puffins (e.g. puffins from the East coast of Scotland mostly winter in the North Sea). Nonetheless, the more we learn about these fascinating birds, the more we will be able to protect them from the many threats which they are or will face, and so it is important to continue these studies in the long term. I am about to start a new 3-year research position at Oxford to pursue this research – so keep an eye on this blog for further puffin discoveries!